Show those vintage quilt tops some love! 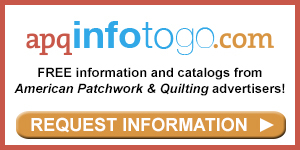 Linda Augsburg chats with Vicki Hoth and Brenda Groelz from Handi Quilter about tips for finishing vintage quilt tops. Hi I'm Linda Augsburg with American Patchwork and Quilting and I'm here with Brenda and Vicki from Handi Quilter, and Brenda you are a big collector of vintage quilt tops. I absolutely am, I'm a quilter as well but I have turned into a collector, I have been collecting vintage quilt tops for more than 40 years. Wow. And you've got a great collection, now you have certain things you look for when you're buying a vintage top. You know the things I'm looking for for have changed through the years, when I was a 20 year old farm wife going to farm sales and buying quilt tops like the one behind you with all the hexagons, I was frankly thinking about quilt tops that didn't need a lot of quilting and now that I've been at Handi Quilter and rubbing shoulders with people like Vicki, I have turned into someone who looks for quilts with lots of real estate. So tell me what real estate means? I'm going to let Vicki tell you. Well real estate means there is open property, whether it's a solid color like this or there's a lot of white or (big circle spaces), a light color, yeah this is all solid, but property, real estate to really let the quilting show. So not just big open areas. 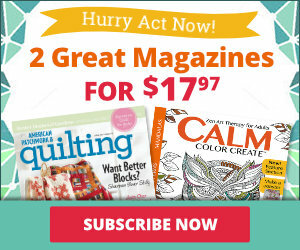 Not just, you could, totally big open areas but real estate to because I want my quilting, I'm the quilter and I want that quilting to really be a main event in the quilting. And maybe some quilts you don't. So you want that piecing, but the quilting has got to stand on its own too. Well speaking of the quilting standing on its own you showed me this triangle quilt and you saw something very different than the rest of us saw. And Brenda didn't see this, you know, when she said Oh I want this quilted, you didn't see this, but I'm going to roll this plastic or preview paper out, This is what I saw. Oh a star. That's right, and so I, this is a vintage quilt, it needed feathers (of course) so we start in the center and add a spine, a curved spine and bring that down and we can stitch right back down and then just start quilting feathers. And fill this up with feathers, and it's a lot easier to quilt on fabric than it is to draw on plastic, ha ha (of course it is), and then just come back down and like I say it's a lot easier. Oh look how shaky that is. Bring that in and then just repeat that on every feather around there. Did you make a conscious effort to pick one thread color or how did that work for you? I actually choose white, so that it matched here but it goes well in that yellow it just blends through there. ?White is also, (Vicki, I don't believe it's white) It is, it is Brenda. (it looks pink in the pink). I know, it's like a chameleon thread that, the thread picks up the color of the fabric, it really is. So as we look through here it does look like it's peach (it really does) but it's white. That's great. Now is there anything that you would do different if you did this quilt again? Why would you ask that? Yes, I always think that, I would actually probably do a channel around here that would even frame that more. (Ok.) And I only used one layer of batting on this, I would use two layers because then you would really see some deep texture. (That would really pop) You know Linda that two layers of batting is something that the Handi Quilter educators have taught me, they'll use an 80/20 batting as a foundation layer and they'll put wool on top of it and it's that wool that pops up in those beautiful feathers and other kind of open quilting designs. 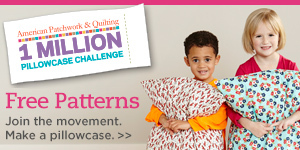 Well when you're an amazing quilter you really do want that quilting to show, so that really helps it pop. Now we've got a second example here. So you talked about thread color. (I did.) Ok, so you see the thread color here, I wouldn't use red in the white because that just wouldn't work would it? (No it seems like it would be a little too showy.) I want that texture in the white but would I use white in the red? (Um.. it's going to distract.) I really like the red so there was a thread color change, Yellow, the red so let's look on the back, And you can see the red which is there's not a problem with that on the back, you know having that red, it's a different, a whole another quilt on the back. (Yes it's beautiful on the back.) 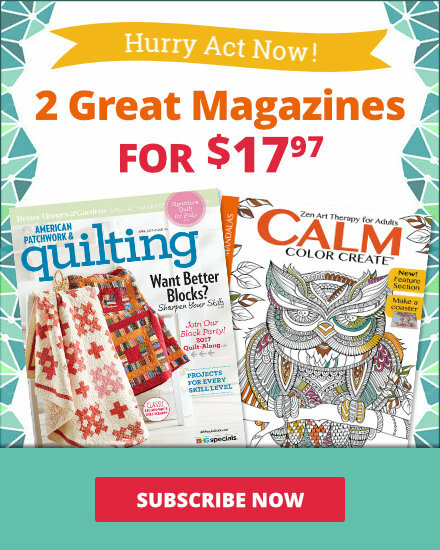 Vicki, I've heard a lot of beginner quilters who come to us and say they want to use one thread color on the back and they want it to match the back, so this would probably bother some people, so why is this a good idea? Well, because as you're doing long arm quilting and you're moving that machine in all directions there is always a tendency for the thread to have just a change of tension a little bit so you want to match the top thread with the bobbin thread and you hear quilters say No I don't want to do that I think wait if you are hand quilting this what thread are you going to choose because you're going to get the same thread going down and in and out. And now when you are quilting this long arm would you have done the white pass of thread first and then come back in and done the (That's a good question.) red pass and yellow pass. Is that how you do that? There's so much white in it, I would have gone through and stabilized it, I would have done stitch in the ditch and you know created the channels that are here, and then, see it's all stable then and then and you can go back and put in your feathers and change your thread colors, use your red then go to your yellow. That would have been a lot easier but it would have been all stable on the frame. You know Linda she made a good point about stabilizing this quilt because quilt tops that you purchase on auctions and sometimes I buy them at those farm sales and sometimes I buy them on e-bay, there's usually a reason why they were never quilted, why they were never finished. And so the long arm quilters inherit all kinds of challenges with these quilt tops and stabilizing them, keeping them as straight as possible, that's why Debbie Brown stitched in the ditch on this one and I think we can even show folks there's a little pucker right here and Debbie did her best to incorporate that in the quilting but that pucker was there before Debbie got the quilt top, (Right there's only so much your quilter can quilt out.) That's right. But it's still beautiful. Exactly. But when you say that, the tighter the more densely quilted it is, you can quilt a lot out. Now we've also talked a little bit between us about getting this quilted, so while I might think of hand quilting a vintage top, time just doesn't always allow that. It would be wonderful if the whole world could have hand quilted quilts, if we could hand quilt everything but nobody's got the time to do it, So long arm quilting or machine quilting a vintage quilt top is a perfect viable solution. For one thing you are stabilizing that quilt top, quilt tops are open to the world the seam allowances will fray, it's the reason we don't allow anybody to wash these quilt tops before they're quilted, even if they're a little smelly, right Vicki? Or have stains on them. So we do launder them after they're quilted but the quilt top itself can be rather fragile. I'm also careful when buying quilt tops not to frankly I don't have the budget to buy museum quality quilt tops. (Ok.) So there's no danger of something being taken from that museum stream with the kind of quilt tops I'm buying. These are hand loved pieces, often hand pieced that were not finished and today we can finish them, we can enjoy them and our children can enjoy them. That's great, done is sometimes most important, especially if it's an heirloom top, you know something you've gotten from a family member; I'd much rather have it finished and being in use than sitting in a trunk somewhere because it's not quilted. That's my philosophy as well, I think if you've got a quilt top you're really concerned about you think maybe some museum would like it or there's something important about it, you should talk to a quilt appraiser about it and have them give you the go ahead. (That's a good idea.) So are there any other special considerations when working with vintage quilt tops. Just love them, don't we? I was going to say that the wet cleaning can be a problem with old textiles, sometimes they're not as (colorfast) yes, so you've got to be really careful about that. Alright so a little something in there maybe to catch that color as you're laundering. And I would also advise doing it with front loading washing machines, don't ever put a quilt in a washing machine with a ringer in the middle that's just asking for trouble but front loading machines are much gentler and easier on your quilts. Thank you both so much for these tips, I know they're going to help other vintage top collectors like me get those tops quilted.